CakeSpy Note: OMG! The 46th Annual Pillsbury Bake-Off is coming! Since I so deeply loved attending the 45th Bake-Off, I thought I would get you excited early by sharing some of the finalists' recipes. Narrowed down from zillions of entries, I'll profile some of the 100 finalists--but of course, based on the subject matter of this site, I will focus on sweets! You can follow them by clicking the bakeoff tag below the post to see which ones have been posted so far. Enjoy! Wendy Wiseman of Bella Vista, Arkansas is my new favorite person. Why? 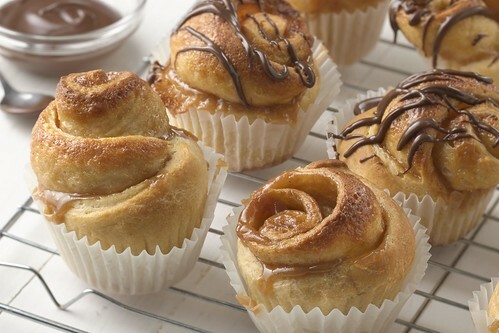 Because she's the one who dreamed up these decadently dreamy Peanut Butter Caramel Sticky Rolls. I have no doubt that sticky fingers are a problem around these rolls, not only because well, they're sticky, but also because people will want to steal an extra after they've had a taste! Here's how you make 'em. Heat oven to 400°F. Place paper or foil baking cup in each of 12 regular-size muffin cups. Generously spray with No-Stick Cooking Spray. In small bowl, mix powdered sugar, caramel topping and peanut butter until blended. Unroll both cans of dough. Spread half of the caramel mixture evenly over each dough sheet to within 1/2-inch of edges. Starting on short side, roll up each dough sheet. Cut each roll crosswise into 6 pieces. Place cut sides up in muffin cups. Bake 12 to 18 minutes or until golden brown. Remove from pan to cooling rack. Cool 15 minutes. Meanwhile, in small microwavable bowl, microwave chocolate hazelnut spread on High 30 to 60 seconds. Drizzle over rolls.